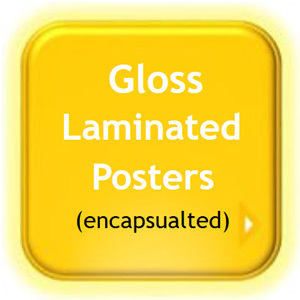 These gloss posters are laminated front & back (Encapsulated) using heat & high pressure to create a permanent bond. The gloss finish will make the colours even more vibrant & vivid making your poster stand out. Printed at high resolution onto high quality paper & colour calibrated. Ideal for: Presentation Posters, Gloss Photos, Maps, Weather Proof Posters for Outdoor Use. *The Laminated edge seal will add 4mm to each side. *Can be used with dry wipe pens & will easily wipe clean.